If you want to add architectural detailing to a room, but don't have the budget for custom carpentry, try this easy DIY project that tricks the eye and costs a lot less! We love the look of planked walls, but using good quality wood to cover the surface of all your walls would cost a pretty penny! 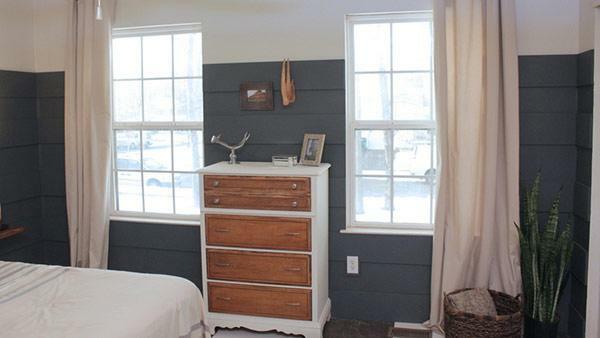 The idea behind this project is that by alternating 8 inch planks of MDF and 8 inches of exposed wall, painted the same color, you'll think you're seeing fully planked walls, but really, you're not! 1. The first step is measuring the length of your walls and determining how high you want the planks to go. We decided to go 3/4 of the way up the wall in this room. Make a mark on the wall where the first plank will go, on either side of the wall. Use a chalk line to make a level line on the wall. You can double-check the line with a level- the last thing you want is wonky planks! 2. Measure down 16 inches (remember- you're including the 8 inch plank, and 8 inches of exposed wall!) and repeat the chalk line process. Continue down to the floor. We removed the base molding and used one of the planks in it's place. 3. Cut the planks to the length needed using a chop saw. MDF is really dusty, so be prepared to wear a mask! 4. Grab a friend for this part! Line the first plank up with the top chalk line making sure to hold it level. Shoot a few nails into the board at one end with a nail gun, then do the same at the other end. Don't worry about seams if you need more than one plank per horizontal line - you can fill those in later with putty! Do this same process on the walls. 5. Go back and putty the nail holes and seams. Sand when dry. Caulk along the edges of each board to create a really nice, finished look. 6. Painting both the planks and the wall the same color is what really pulls this project together. Go ahead and roll on the paint in nice, even coats. These "planked" walls that trick the eye are a great way to add architectural interest to a room without breaking the bank!